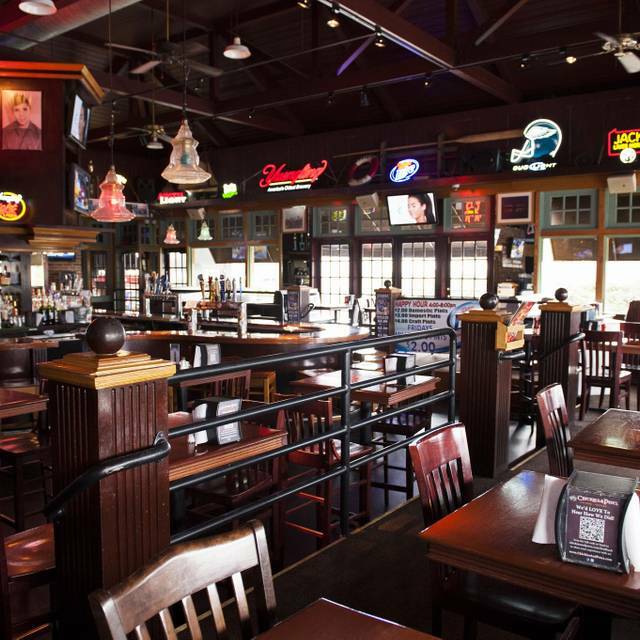 You must make reservations at least 5 minutes in advance of the time at Chickie's & Pete's - Roosevelt Blvd. This large Northeast Philadelphia location opened in 1999 and is located at 11000 Roosevelt Boulevard. Indoors it features two big bars, a private dining room, a 14-foot Big Screen, and plenty of TVs to meet every sports enthusiast's needs. Outdoors the Boulevard offers an all-season covered patio and deck where we often conduct large parties and feature live bands amongst the expansive bar and updated TVs. Great food and fast service. We enjoyed the drinks and food. My kid’s cheesesteak didn’t arrive until after the rest of our party had finished eating. It’s a cheesesteak in Philadelphia, so should never be a problem. I ordered ultimate burger. Crab cake on a burger sounds good, but half burger was well done and half medium rare. It was so,loud you couldn’t hold a conversation, the ac was leaking on customers. Half of our table received their food and were just about finished by the time the rest of us were served. I asked for pickles on my cheesesteak and got 2 pickle chips UNDER my sandwich. My roll was sliced through so the cheesesteak fell all over while I was trying to eat it and it’s flavor was mediocre at best. Our waitress was friendly and helpful but the kitchen was extremely slow. Great crab legs. Good service. This is one of the Chickie & Petes in and around the city - great place to watch sports, grab a drink and have crab fries and chicken tenders. We had wings and the crab dip special they were good. Unfortunately, there was only one game on baseball which I am not a fan of but it was a great spot for after a movie. I’m never disappointed coming here. Great beer list and good food. Been to Chickie & Pete's several times in the past with great results. Not this time! Steak sandwich meat was dry and chewy. One guest had crab cake delivered with a spicy sauce, asked for tartar sauce and was told that do not have it! Really, a restaurant that serves seafood and dies not have tartar sauce!! No rush to return to this location. Our server Sean was amazing at his job! He did not need to write down anything for our group of 6, he got all the orders correct and everything was out in a timely manner. We had fun playing the song bingo on Tuesday night. Sean told us a funny story about Sweet Caroline and had us all cracking up laughing. My grandparents are needy and love good food and they had a great time out for my brother's birthday. Great experience for a large group with kids! My first time there and I would definitely go back. The servers were very accommodating. We had a 7pm reservation and we weren't seated until 7:30pm! They forgot that we checked in - twice! The older blonde woman with tons of makeup on acted like she couldn't care less when I asked about our table. No eye contact at all. The whole check in area is chaos. When we were finally shown to a table I can clearly see 4 or 5 empty tables - we could've been sat sooner! Why did I even bother to make a reservation?! Get it together, Chickies! service was great. group was about 20min late but was not a problem for the staff they held are tables. Upbeat environment. Professional and courteous staff. Waitress took time to explain menu questions. Food was served promptly. Super easy to make the reservation online. Table was ready for our party of 12 and our waitress was awesome! We were celebrating our friends 65th birthday we had a wonderful time will be back again great service. Went on a Saturday night. Wasn't too crowded, but our waitress had too many tables. We waited for drinks way too long. Four dinners ordered and they all came out at different times by different people. I ordered a meatball parm and actually laughed when it was put in front of me. It was a small roll with two meatballs. Don't get me wrong, it was good, but nowhere on the menu did it indicate the size. Oh well, lesson learned. This was my first time at your restaurant. I've been wanting to go for many years since I'm originally from Philly and cheer for all the Philly teams. I'm so glad I finally got a chance to go. This had to be one of the most horrible dining experiences I have ever had. First it took forever for the Crab fries to come out. And they where warm at best. Second, our dinner was brought to us in a to-go bag. I was like really. They took the bag back into the kitchen and 10 mins later the same food, only cold was brought to the table. Then they took the food back to the kitchen and brought it out now a third time. And colder. After being told they where remaking the food. We than asked for the manager, who came out and seemed annoyed, told us they where remaking the food for the third time. At this point we had been there for over 45 mins and only had Crab Fries. We told the manager we just wanted to go. Absolutely a horrible experience on every level. We had reservation on Thursday March 9, 2017, for 7 people at 7 pm on all you can eat crab night. They are always busy but since it was all you can eat it was even busier than usual. We all arrived in the parking lot at the same time. Four of us went in while the others parked so we could let them know we had arrived. Upon checking in we were told they were getting our table ready and we would be seated in a couple of minutes. The rest of our party parked and came in. After about a 20 minute wait we went back up to the counter to inquire about our table. The gentleman was extremly rude to us. He said he didn't see any reservation. We told him that we had been standing there waiting for the table they said they were preparing for over 15 mins and he said impossible because he had been there over 15 mins and did not know what we were talking about. We pulled out our reservation confirmation on our cell phone and showed him that yes we do have a reservation. We waited another 10 mins while they scrambled to find and get a table ready for us and said that they would "take care of us". Once we did finally get seated and placed our order we then had to wait even longer since the kitchen was backed up due to the volume. This was supposed to be a nice family dinner for a birthday celebration. Instead it was an expensive disaster. The only saving grace for them that night was our waitress who was very attentive and apologetic. We used to always enjoy our visits/meals at Chickies and Petes but this last one has literally left a bad taste in our mouths. Reserved table for 12 for 730pm, but wasn't seated until 8. Service afterwards, however, was wonderful. Food came out as they were ready, which was fine. Food, was not as good. Had fried shrimp, tasted great, boneless buffalo wings were forgettable, chicken signature salad was not appetizing at all. Overall, the price did not match the experience. Our server was the only saving grace of our experience. Food was amazing as were the drinks. Service was top notch. Seemed abit pricey but not that bad. Apparently when we made the reservation through Open Table the computer assigned us a table. We've been here many times before --- when we told the host & hostess that we preferred a different table, they were confused. We spent the next 10mins waiting at the desk while they literally hid behind the podium trying to figure out how to override the computer. We waited an hour with our reservation. We were a larger party (7)but the staff were not in touch with us at all during the time we waited about trying to accommodate us or trying to put together tables to fit us. That lack of communication is why I will never dine here again. I understand delays, but that was unnecessary. I was not happy this time. I am usually very happy at this location but this time we were crammed into a makeshift seating arrangement in the very tight fitting back room. The servers had a hard time serving the food and forget having to get up for any reason. It was not the birthday celebration that I anticipated for my sister. I thought with the open table reservation that we would have had a table ready for us. Whenever my family comes into the city to visit, we like to meet here. There is always something for everyone, and who doesnt like the crab fries! I enjoy the atmosphere, food and service. Waitress was great! But we made reservations bc we had a large group. After waiting 20 mins we had to sit outside on the patio and it was FREEZING. Won't be returning again.